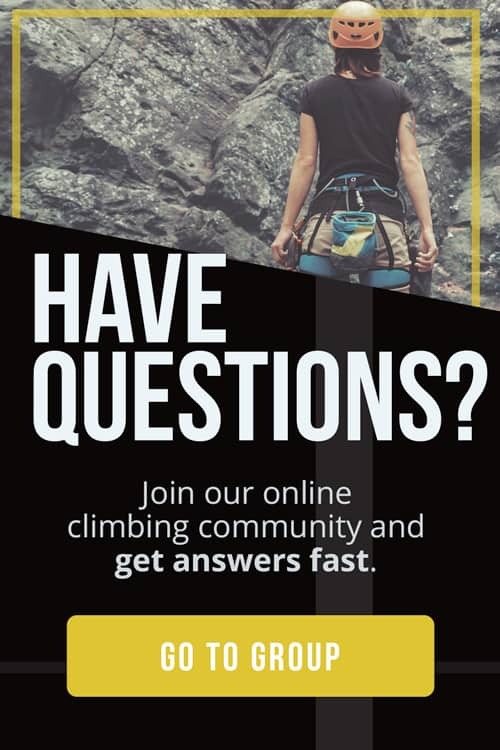 So you’re trying to progress in your climbing and you’ve hit a wall and want to get stronger. Training is one of the great progressions for the new generation of climbers who frequent climbing gyms. Instead of simply getting as much mileage on real rock as possible, they train with a hangboard workout and then climb even harder. You may have seen hangboards at the local climbing gym, but how do you know the best way to use one? 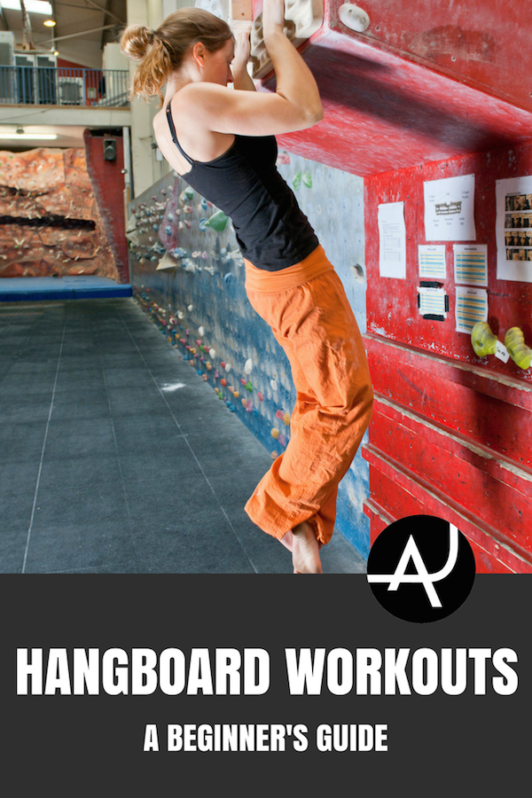 One of our big goals here at The Adventure Junkies is to show you how to develop the best hangboard workout for you. 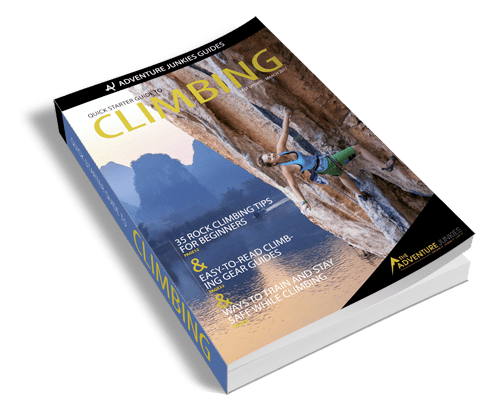 If you have the time to dedicate to some training, you’ll soon be breezing through the best hangboard workout, and eventually, see that translate to great gains in your outdoor climbing. 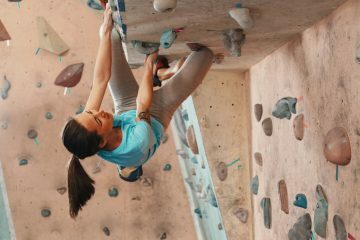 There are several ways to train for climbing, but hangboard training is one of the best ways to build specific strength in your fingers, upper body, and core. There are a number of different hangboards, but they all serve the same function – to allow you to work specific muscles by hanging or pulling on a variety of holds. 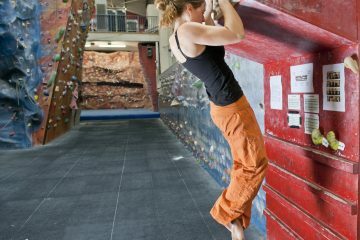 If you’re not careful, hangboard workouts can also leave you injured and out of climbing for several weeks. It’s important to know your level and stick to a routine so you’re not doing too much, too quickly, which is a recipe for injury. Many injuries can strike if you’re not sufficiently warmed up. Start by doing some dynamic stretching. 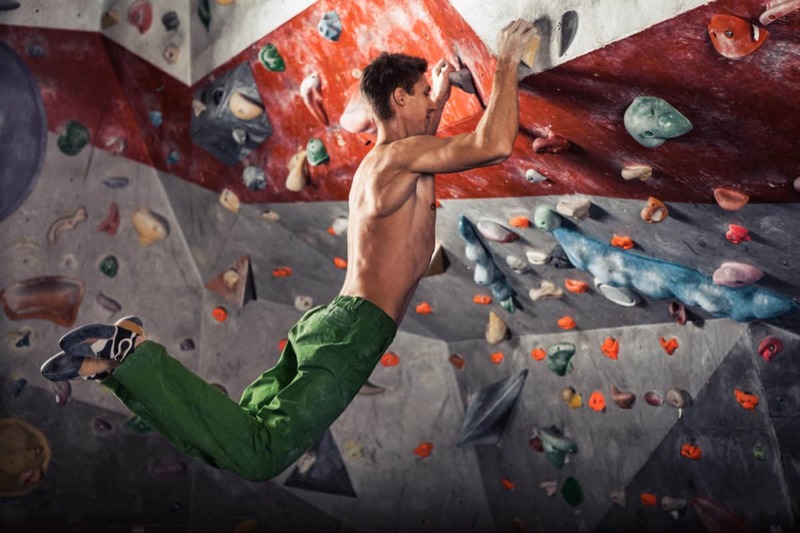 If you’re in a climbing gym, spend about 15 minutes bouldering on easy problems after your warm-up stretches. If you’re not in a gym, you can still do some push-ups, jumping-jacks, and easy pull-ups on the hangboard using the largest holds. Once you’ve got the blood flowing, chalk your hands up and you’re ready to begin. Hanging on tiny holds puts a lot of pressure on your tendons and ligaments, as well as your muscles. A common mistake is to do pull-ups on holds that you can barely hold in the first place. Isometric training builds strength by holding static positions and is less injury-prone. Dead-hangs are when you simply hang off certain holds without pulling up or down. There are different methods for hangboard training, but all of them are based on repeating a set of dead-hangs on small holds for around 7 to 10 seconds, and then resting for a similar number of seconds. Repeat on the same holds three to five times. This is one set. Choose about seven different types of holds to begin with, from small crimping edges to pockets to slopers to pinches to jugs. Start on one of the smaller holds and do three sets, resting in between each set for two minutes. After the third set, move onto the next hold and do three more sets. Continue until you have completed your circuit of about seven holds. It is important to use proper technique to minimize the risk of injury. Engage your shoulders by squeezing them towards each other and your arms by bending your elbows slightly. Hanging on your skeleton may be easier on your muscles, but it puts a strain on your bones that they were never meant to endure. Engage your core as well to try and keep your legs and lower body from swinging. This is also will help to keep consistent pressure on your shoulders, arms, hands, and fingers. There are different schools of thought on whether to use an open-hand, half-crimp, or full-crimp position on small edges. An open-hand crimp puts less strain on your finger tendons, and is therefore less likely to injure you. Open-hand training will also strengthen your fingers for half- and full-crimp positions. 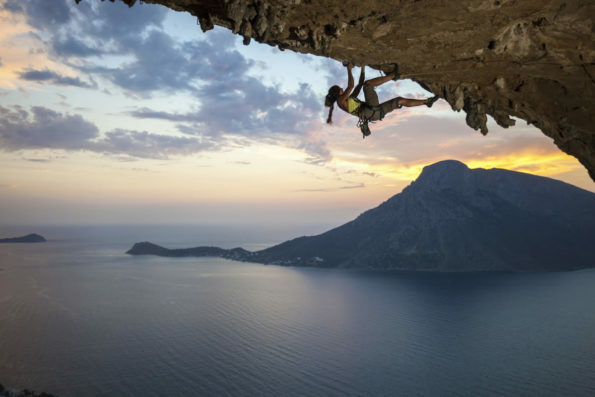 But climbers often use the full-crimp position on real rock, so some climbers believe it is important to train all three specific positions. If you do, take it easy and don’t put too much strain on the full-crimp position. The holds you are using are about the right size if you’re near failure at the end of your last set. If they are too hard to hold onto, you can use a box to rest your feet on, which will take some weight off your arms. Make sure to keep your core engaged to prevent your body from sagging. If the holds you are using are too easy to hold, you can move to smaller holds, or put extra weight on you, either by using a weight-vest or by putting on your climbing harness and clipping gear onto it. Hangboards can also be used to build power by training pull-ups. We recommend you start with dead-hangs to build initial tendon strength, but as you get stronger – after a few weeks – you can begin to incorporate pull-ups into your hangboard routine. A set of pull-ups starts on two holds. They don’t have to be the same type of holds, nor do they have to be level. Offset pull-ups are popular because they more closely mimic the movement of climbing on real rock. Select two appropriate holds and do three pull-ups. Rest for 15 seconds, and then do another three pull-ups. Repeat until you have done a set of three or four laps on the same holds. If you’re doing pull-ups, pay close attention to any pain in your elbows. If you feel any, cease immediately and return to dead-hangs. Core strength is vital to strong climbing performance, as it allows you to take weight off your arms and fingers. Hangboard training also includes core workouts, including L-hangs, leg lifts and front-levers. If you’re just starting, leg lifts are the easiest. Take the largest holds on the hangboard, and then lift your knees towards your stomach 10 times. Try to keep your back as straight as possible. As your core strengthens, you can try hanging for 30 seconds with your legs bent at the knees, When that becomes too easy, hang with straight legs in an ‘L’ shape. The most advanced core training is to front-lever, meaning to hang from your arms with your body completely horizontal. This should not be attempted unless you are at an advanced stage. Now that you’re acquainted with dead-hangs, pull-ups and core training, try alternating between the three to get a more complete workout. Do a set of dead-hangs followed by an L-hang, and then a set of pull-ups followed by 10 leg lifts. Remember to take a good rest in between each set, and monitor your body – elbows and fingers in particular – for any pain that might be a forerunner to injury. After a few weeks, you will probably find that your last repetition isn’t bringing you as close to failure as it did in the first week. You want to increase the weight by about 5 per cent per month. Remember – doing too much, too soon, is a recipe for injury. 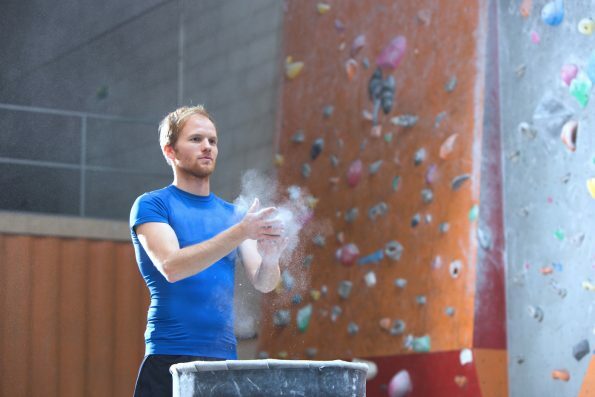 After several months, when your training becomes far more advanced, you can play with hanging off fewer fingers, or on smaller holds, or for more sets. The principles remain the same – look to be close to failure on the last repetition. At the end of your hangboard workout, do some static stretching to help prevent your muscles from getting too tight. To make strength gains, a proper resting period after your training day is essential. Take two full days off before hitting the hangboard again. Start off slowly. Tendons and ligaments take longer to strengthen than muscles, and going too hard from the start will likely leave you with injury-prone imbalances. Improving strength is a long path with no short-cuts. In the beginning, you should aim to hangboard train twice a week, with lots of rest in between. Don’t expect to see immediate results, but if you persist, then you should be noticing solid improvements after four to six weeks – both indoors and outdoors.